USES: Calcitriol is a man-made active form of vitamin D. Most people get enough vitamin D from exposure to the sun and from fortified food products (e.g., dairy products, vitamins). Vitamin D helps control parathyroid hormone and the levels of certain minerals (e.g., calcium, phosphorus) that are needed for building and keeping strong bones. Before regular vitamin D can be used by the body, it needs to be changed to the active form by the liver and kidneys. 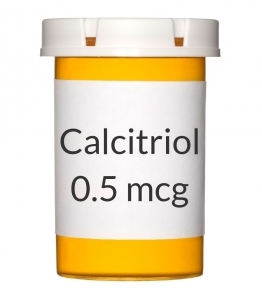 Calcitriol is used in patients with kidney disease who can't make enough of the active form of Vitamin D. This medication is also used to prevent and treat certain types of calcium/phosphorus/parathyroid problems that can happen with long-term kidney dialysis or hypoparathyroidism. Calcitriol is usually used along with specific diet recommendations and sometimes other medications. OTHER USES: This section contains uses of this drug that are not listed in the approved professional labeling for the drug but that may be prescribed by your health care professional. Use this drug for a condition that is listed in this section only if it has been so prescribed by your health care professional. This drug may also be used to treat and prevent certain bone diseases (rickets, osteomalacia) when regular vitamin D does not work. HOW TO USE: Take this medication by mouth with or without food, usually once daily or as directed by your doctor. If you are using the liquid form, measure your dose with a special measuring spoon or device. Do not use a normal household spoon since you may not get the correct dose. Dosage is based on your medical condition and response to therapy. Your doctor may start you on a low dose and adjust the dose slowly to find the best dose for you. Follow your doctor's directions carefully. Use this medication regularly in order to get the most benefit from it. To help you remember, take it at the same time each day. It is very important to follow the diet recommended by your doctor to get the most benefit from this medication and to prevent serious side effects. Do not take other supplements/vitamins (e.g., calcium, vitamin D) unless ordered by your doctor. Certain medications (bile acid sequestrants such as cholestyramine/colestipol, mineral oil, orlistat) can decrease the absorption of vitamin D. Therefore, separate your doses of these medications as far as possible from your doses of calcitriol (at least 2 hours apart, longer if possible). It may be easiest to take calcitriol at bedtime if you are also taking these other medications. Ask your doctor or pharmacist about finding a good dosing schedule that will work with all your medications. SIDE EFFECTS: Calcitriol does not usually have side effects. Your doctor may check your calcium and phosphate blood levels and adjust your dose if you have side effects. Remember that your doctor has prescribed this medication because he or she has judged that the benefit to you is greater than the risk of side effects. Many people using this medication do not have serious side effects. Tell your doctor immediately if any of these unlikely but serious side effects occur: loss of appetite, back/bone/joint/muscle pain, constipation, dry mouth, eye pain/redness/sensitivity to light, headache, fast/slow/irregular heartbeat, nausea/vomiting/diarrhea, sleepiness, stomach/abdominal pain, increased thirst, change in the amount of urine, weakness. A very serious allergic reaction to this drug is unlikely, but seek immediate medical attention if it occurs. Symptoms of a serious allergic reaction may include: rash, itching/swelling (especially of the face/tongue/throat), severe dizziness, trouble breathing. This is not a complete list of possible side effects. If you notice other effects not listed above, contact your doctor or pharmacist. In the US - Call your doctor for medical advice about side effects. You may report side effects to FDA at 1-800-FDA-1088. In Canada - Call your doctor for medical advice about side effects. You may report side effects to Health Canada at 1-866-234-2345. PRECAUTIONS: Before taking calcitriol, tell your doctor or pharmacist if you are allergic to it; or to other vitamin D products; or if you have any other allergies. This product may contain inactive ingredients, which can cause allergic reactions or other problems. Talk to your pharmacist for more details. This medication should not be used if you have certain medical conditions. Before using this medicine, consult your doctor or pharmacist if you have: high calcium levels. Before using this medication, tell your doctor or pharmacist your medical history, especially of: heart disease (e.g., irregular heartbeat, coronary artery disease), kidney disease, kidney stones. Notify your doctor beforehand if you will be having surgery or will be confined to a chair/bed (immobile) for a long time. Being immobile for long periods of time increases your risk of side effects. Be sure to drink plenty of fluids unless otherwise directed by your doctor. During pregnancy, this medication should be used only when clearly needed. Discuss the risks and benefits with your doctor. It is unknown if this drug passes into breast milk. Consult your doctor before breast-feeding. DRUG INTERACTIONS: See also How to Use section. Your doctor or pharmacist may already be aware of any possible drug interactions and may be monitoring you for them. Do not start, stop, or change the dosage of any medicine before checking with them first. This drug should not be used with the following medications because a very serious interaction may occur: other vitamin D products (e.g., ergocalciferol). If you are currently using any of the medications listed above, tell your doctor or pharmacist before starting calcitriol. Before using this medication, tell your doctor or pharmacist of all prescription and nonprescription/herbal products you may use, especially: cardiac glycosides (e.g., digoxin, digitalis), corticosteroids (e.g., hydrocortisone, prednisone), magnesium-containing medications (e.g., antacids, milk of magnesia), phosphate binders, "water pills" (e.g., thiazide diuretics such as hydrochlorothiazide), vitamins/nutritional supplements (especially calcium and vitamin D), drugs that can speed up the removal of calcitriol from your body (e.g., ketoconazole, phenobarbital, phenytoin). Check the labels on all your prescription and nonprescription/herbal products (e.g., antacids, laxatives, vitamins) because they may contain calcium, magnesium, phosphate, and vitamin D. Ask your pharmacist about using those products safely. This medication may interfere with certain laboratory tests (e.g., cholesterol test), possibly causing false test results. Make sure laboratory personnel and all your doctors know you use this drug. This document does not contain all possible interactions. Therefore, before using this product, tell your doctor or pharmacist of all the products you use. Keep a list of all your medications with you, and share the list with your doctor and pharmacist. OVERDOSE: Overdose of any type of vitamin D is dangerous. If overdose is suspected, contact your poison control center or emergency room immediately. US residents can call the US National Poison Hotline at 1-800-222-1222. Canada residents can call a provincial poison control center. Symptoms of overdose may include: weakness, headache, loss of appetite, nausea, vomiting, stomach cramps, dizziness. NOTES: Do not share this medication with others. Laboratory and/or medical tests (e.g., calcium, magnesium, phosphorus, parathyroid levels) should be performed periodically to monitor your progress or check for side effects. Consult your doctor for more details. Foods rich in vitamin D include: fortified dairy products, eggs, sardines, cod liver oil, chicken livers and freshwater fish. Vitamin D is also obtained from periodic exposure to the sun. It is important to maintain a well-balanced diet while taking this medication. Calcium supplements may be recommended in addition to this medication. The usual recommendation for calcium is 600 to 1200 milligrams per day. Discuss this with your doctor. Do not take supplements unless directed by your doctor.